We had our share of car experiences while visiting Emilia Romagna. After all it isn't called the Land of Motors for nothing. This region of Italy is where Ducati, Ferrari and Lamborghini all originated. We had many car encounters including the chance to drive a Ferrari around a race track, but today we're going to talk about Lamborghini. 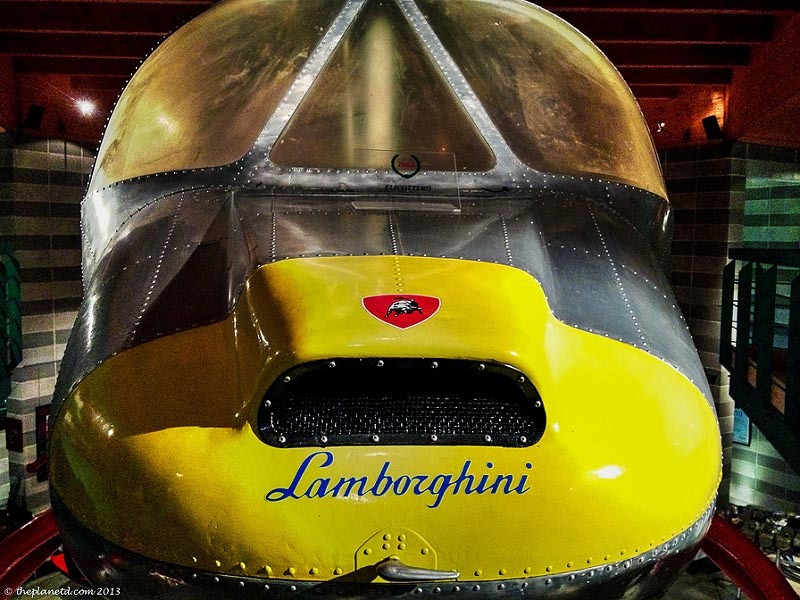 During our time in Bologna, we saw 300 classic Lamborghinis crowd the Piazza Maggiore for the 50th anniversary of the company and we went on a tour of the main Lamborghini museum in a tiny town between Bologna and Modena. 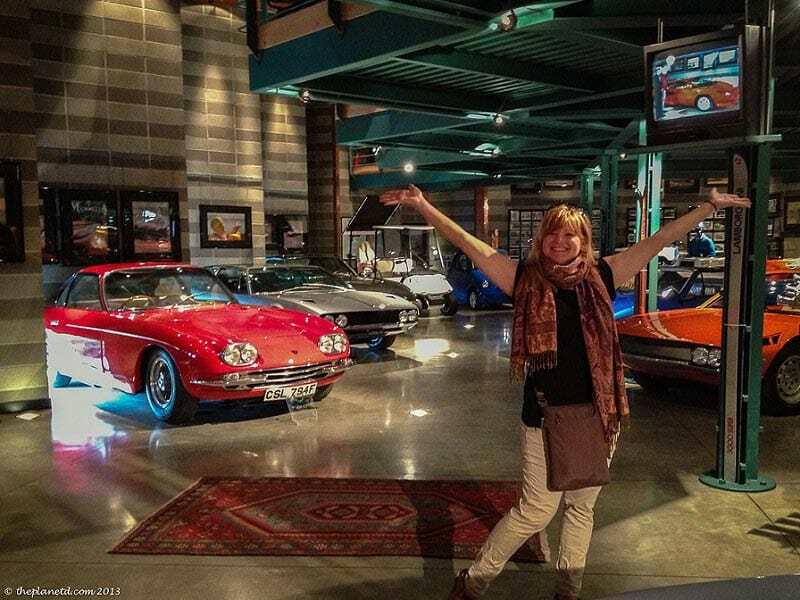 All these auto encounters were amazing, but nothing compared to our private tour of the Lamborghini family museum in Dosso. It is here where you get an intimate tour of Ferruccio Lamborghini's life and legacy on a private tour with his nephew Fabio. I wasn't expecting this! We walked in the front door and Fabio instantly took command as only a man of his stature could. Travel Bloggers, immediately started snapping photos and rushing around, but before we knew it Fabio took charge and said “It is best if you take photos after I finish speaking” And so we listened. We watched, we followed and we hung on his every word. I must say, I have never enjoyed a museum tour so much in my life. We took a tour through history. Starting at the first tractor that Lamborghini ever made. 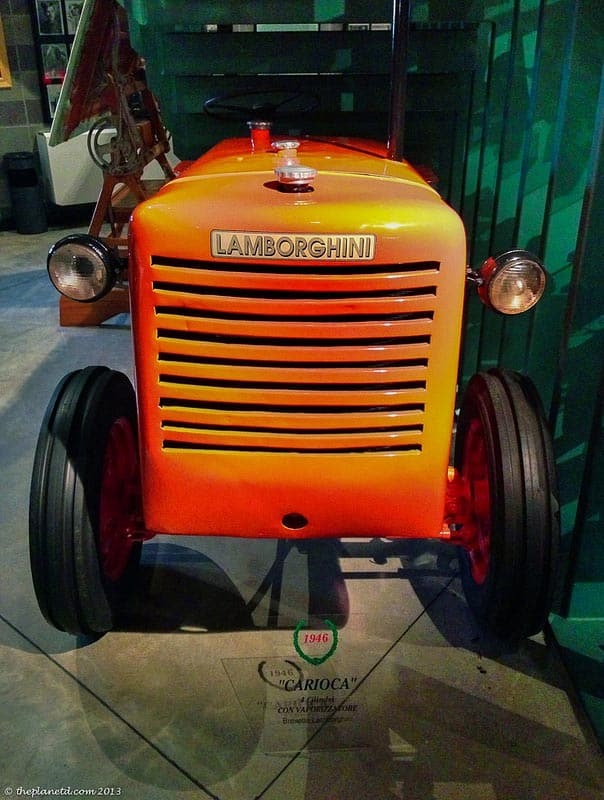 Did even you know that Lamborghini started in the tractor business? Yes, Ferruccio Lamborghini was a farmer. Well that's what Ferrari told him when he approached them with news that their clutch could use some improvements. Ferrari would have nothing of it, who is this farmer to tell us how to fix our car? So Ferruccio decided to take his knowledge and build his own car. Only bigger and better. What sets Lamborghini apart from any other car is how exclusive it is. Not just anyone can own one. You need to be more than wealthy to own one. When we looked up prices during our stay at Blogville, we couldn't find a car under $300,000! As we were led around the museum by Fabio, all I could think about was how much his shoes must cost. I mean, this is a man that comes from a family with a lot of money. And yet, here he was talking to us with passion. 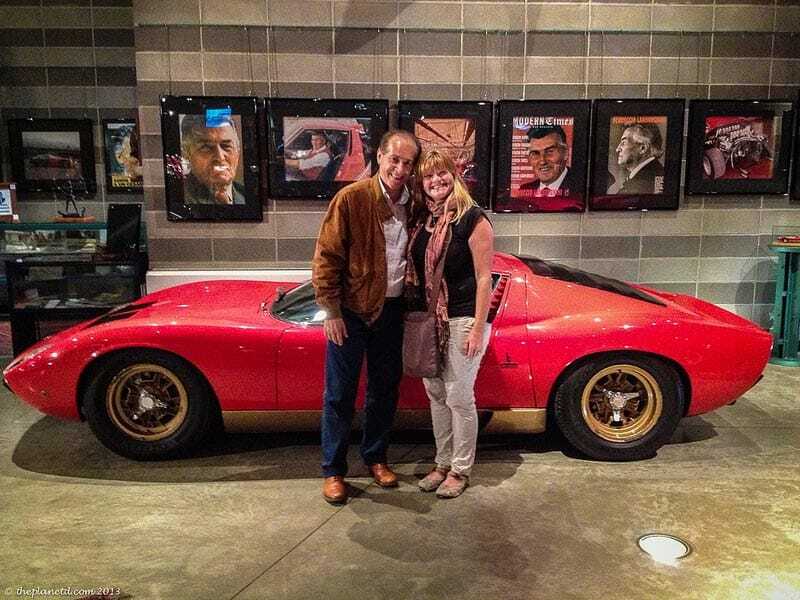 He was fun and approachable and excited to share the story of Lamborghini with us. 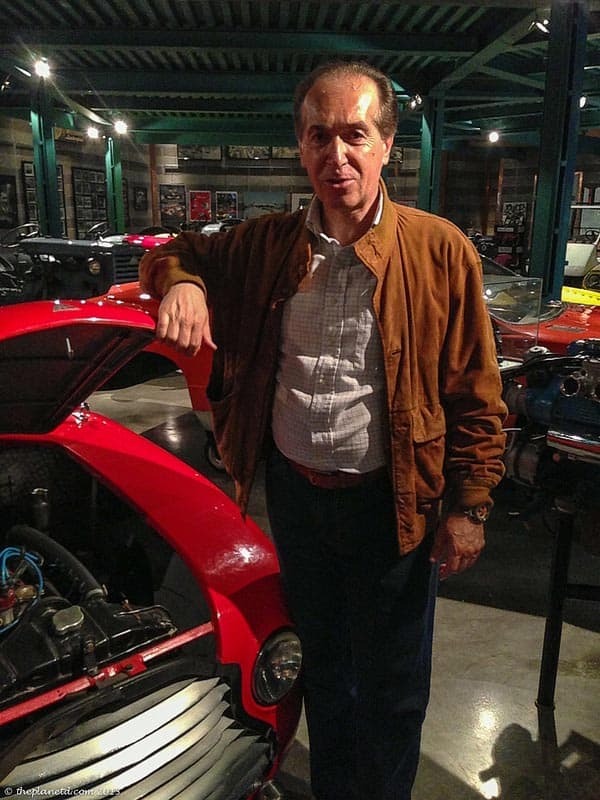 He's the guy who told us about the clutch story and how it motivated Ferruccio to make a great car of his own. He showed us the mini Lamborghini that Ferruccio made for his son to have his own motorized toy car. 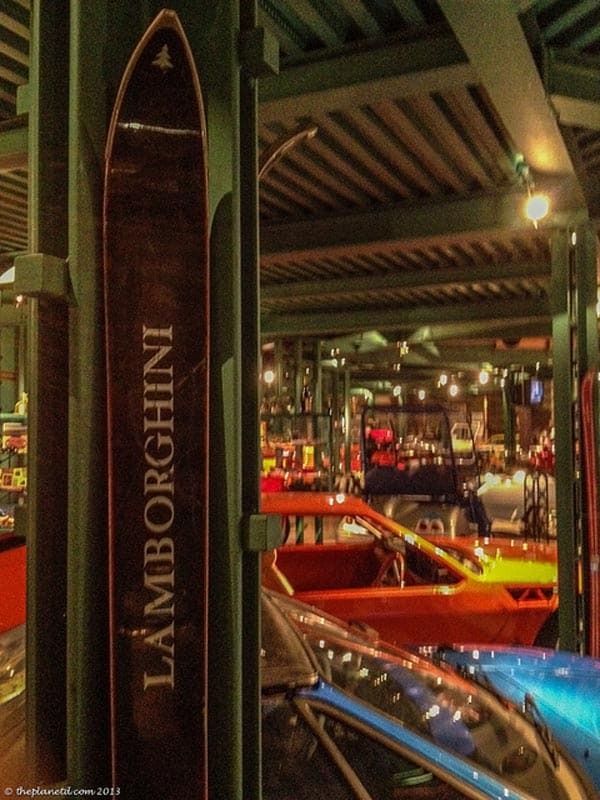 We learned that Lamborghini made everything from skis to helicopters. The helicopter is an interesting story because there was only one made. It was modern and designed with Lamborghini perfection, but the government had a monopoly on building helicopters so he wasn't allowed to make them. Today it hangs from the ceiling of the family museum. 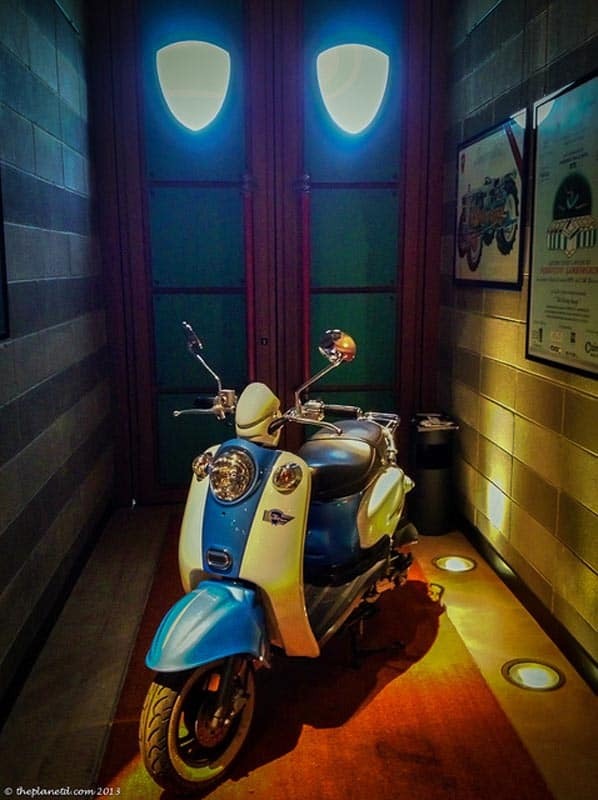 We were amazed to see the Lamborghini “Vespa” and bicycles and air conditioners. This guy loved to build. What Came First DeLorean or Lamborghini? 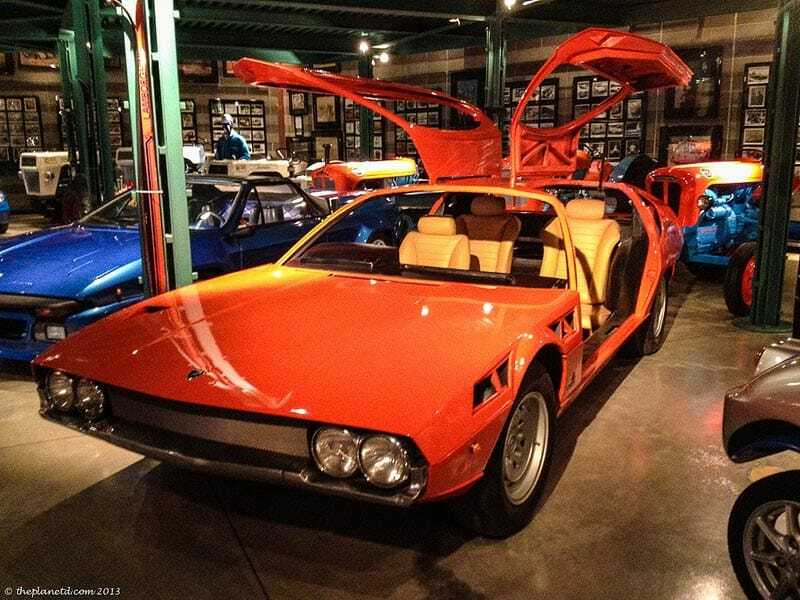 Lamborghini designed a car with gull wing doors long before DeLorean imitated the design and made it famous in Back to the Future. When I asked Fabio why Lamborghini didn't pursue this design he replied, “well it's an inefficient design.” Couldn't argue with that. 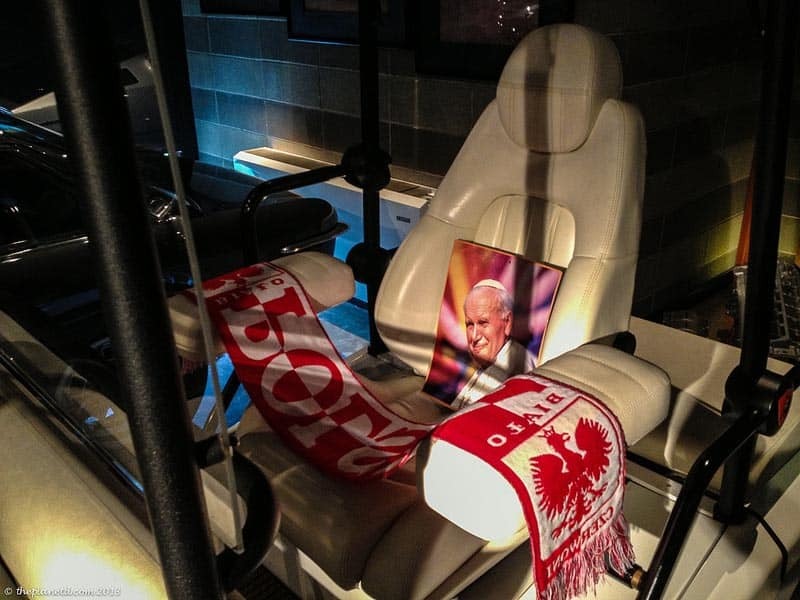 We saw the actual golf cart that Pope John Paul II used during his reign (is that what you call time in office as Pope?) The bullet proof glass was still on it and it was as if the Pope was right there with us on the seat of the cart. We saw Ferruccio's own personal car that he drove in the 1948 Mille Miglia and when Fabio asked us to guess how much it is worth, we came up with all sorts of answers, but the true one was “Priceless, It's not for sale' he said. And then the finale came when we were allowed to sit in a Lamborghini of our choosing. Ok, we had the choice of two. We chose to sit in the classic Countach, you know the one used in the Canonball Run? Ah, Burt Reynolds and Dom DeLuise at their best, they always looked like they were having so much fun in those movies. And then Fabio was gracious enough to let us all pose for a photo with him. What a nice guy. I got his card too! So we're thinking, the next time we're in Italy we may give him a call and see if he wants to go for a spin in one of Ferruccio's classics. I think he'll go for it! We definitely didn't have enough time at this museum. I could have spent much longer looking at all the photographs on the walls and take a slower walk through all the prototypes and gadgets in the complex. Follow more travel bloggers as they explore the region with blogville on Twitter. This is a Blog Ville campaign, created and managed by iambassador in partnership with the Emilia-Romagna tourism board, ThePlanetD maintains full control over what we choose to write. 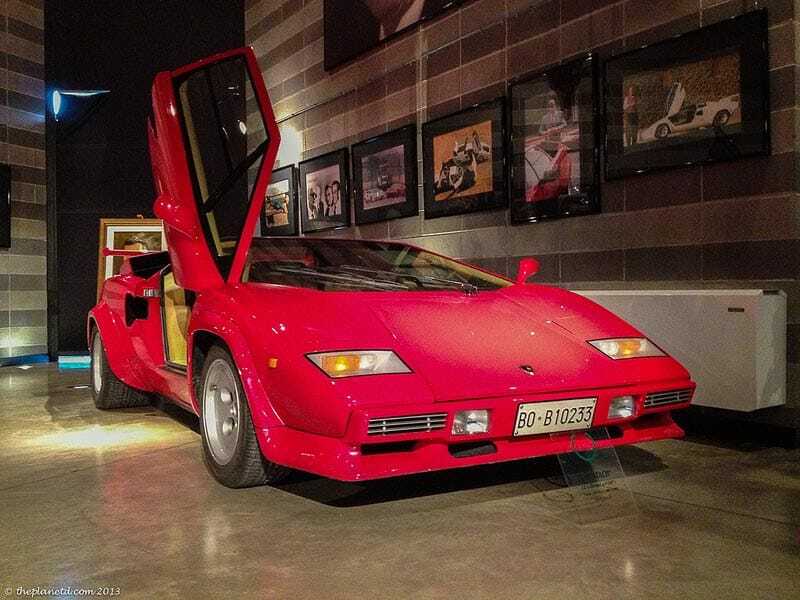 22 Responses to "Lamborghini Museum Tour with Fabio Lamborghini"
I’m curious how much did it cost to do the private tour with Fabio? If he is in town and in the museum, there is no extra charge. I love your blog. Loved the year end pictures especially. Just wondering if the picture of the Popemobile is reversed or if perhaps they put the Poland banner upside down? Thanks for the kinds words John. The picture isn’t reversed. I never noticed that the banner is upside down. It must have just been laid upside down. Good eye! We travelled from Tasmania. Spent a fantastic day with Fabio, he looked after us very well. He organised the factory tour for us and as he was going to the factory that afternoon offered to come on the tour with us to offer his expert commentary. I mean, who else would you want beside you in the Lamborghini factory but Fabio. Thankyou Fabio. The Gull Wing prototype is also pretty awesome! Yeah, pretty cool eh. He thought of everything. I’ve never been much of a car person, but these sure are impressive! We aren’t car people either, but this was definitely a fun tour made even better by Fabio. 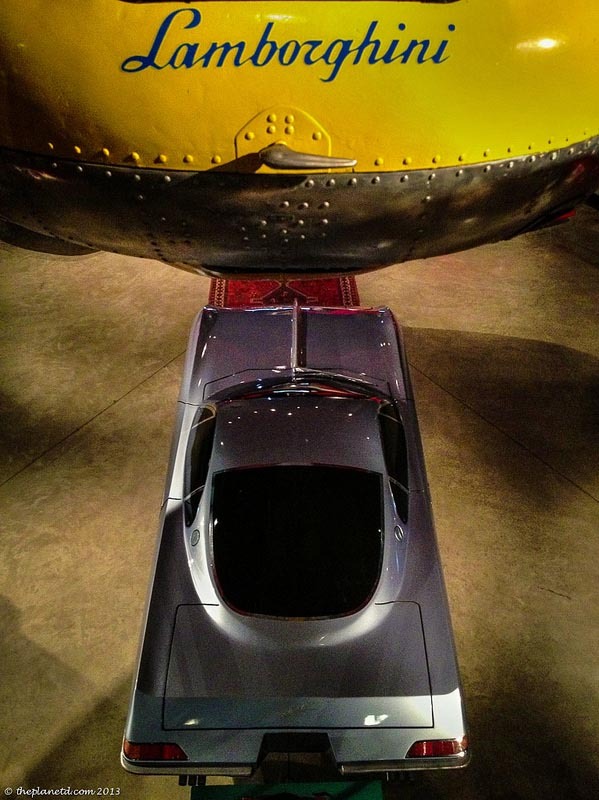 I enjoyed Lamborghini tour here…. found Lamborghini awesome. Thanks Martin, yes Lamborghini is awesome! Tim buys a tshirt just about every place we go too. I think the Pope’s reign is called his papacy. Ha, thanks Jennifer. Tim and Dave are two peas in a pod. We really have to do another night out soon! We’ll get over to you at some point when we aren’t so busy. Thanks about the Pope too. I was thinking of looking it up and then I thought this was more fun to write so I left it. Glad you read it and let everyone know:) Cheers. So the Pope wears Prada and drives a Lamborghini. Oh, Italy! Only in Italy eh! Love it. 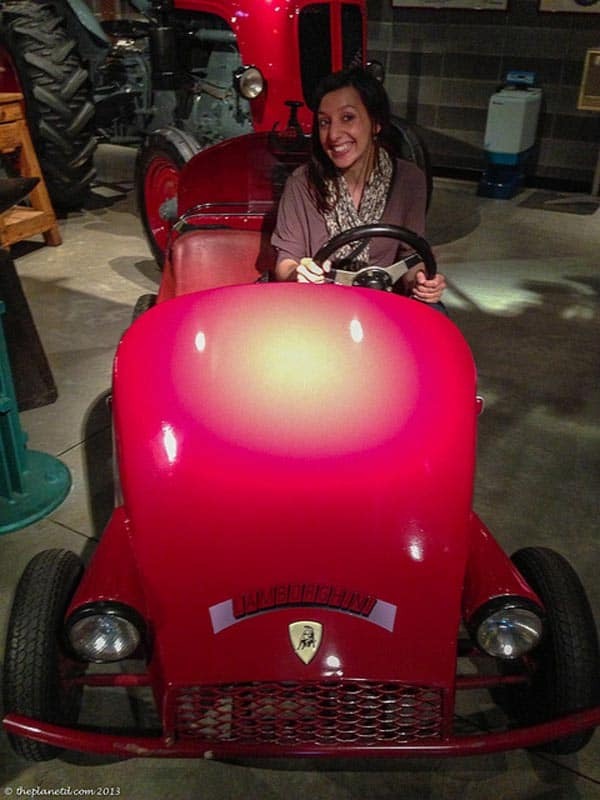 I went to 2 museums today and rode in a trike. Now I am officially jealous. Too bad they didn’t let you take one out for a test drive. Or did they? My husband would have died there! 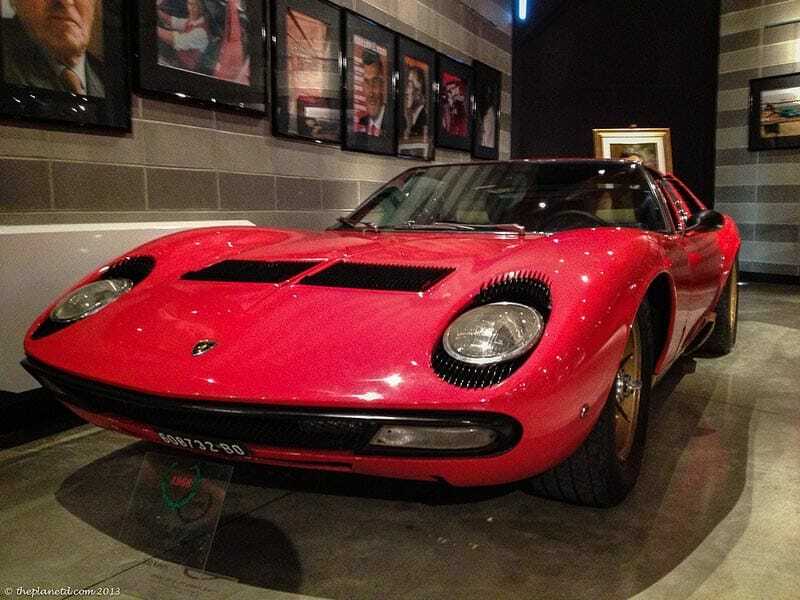 So true, I think all guys drool in this museum. The girls loved it too. But there’s something about men and their cars.